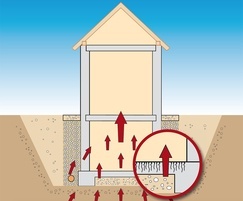 DELTA® Gas Barrier System provides permanent protection from Radon and CO2. It also forms a protection layer against rising damp. With a roll width of 4 x 25m it can be easily and quickly installed with minimal overlaps. 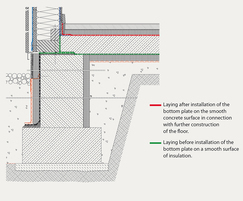 DELTA® Gas Barrier is extremely durable and tough reducing the risk of damage to the membrane on installation. The anti-slip profile on both sides stabilises the sheet and optimises adhesion to mortar. 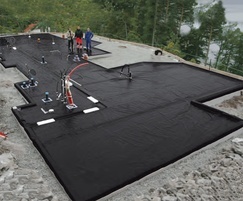 DELTA® Gas Barrier membrane will not crack even at low temperatures and its flexibility allows it to bend around corners easily. 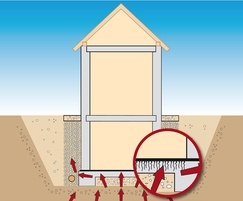 When used with DELTA® gas resistant dpc and preformed units the system offers a completely sealed solution to penetration of gases and ingress of dampness from below ground and through cavity walls. DELTA® Gas Barrier System is compatible with bitumen, resistant to degradation and UV-stabilised. Tightly sealed with products from the DELTA® range of adhesives, the DELTA® membrane becomes a barrier that is highly effective on overlaps and seams.